Hailing from West Palm Beach, Florida, it’s no surprise that Surfer Blood have taken inspiration from their surroundings in both their band name and their material – what you’ll hear is wistful, summer-y tunes which have been expertly released at the right time to make for the perfect seasonal record. The quartet’s style of experimental indie is evocative of bands like Wavves and Real Estate; getting right to the point yet still managing to deliver a sweet and pleasant listening experience. From the kick off with ‘Grand Inquisitor‘, a scene is conjured up and it transcends across the entirety of the record. The lyrics are intelligent; second to none, and sees the band set the bar high for what is their third album – the first since they ditched their major label and returned to their DIY roots. What they’re doing here is most certainly a far cry from what was heard on their debut album, Astro Coast, but it’s no doubt a step in the right direction and a clear sign they’ve matured as a unit. ‘Island‘ sees Surfer Blood tap in with some of their old styling, but following tracks like ‘I Can’t Explain‘ and ‘Sabre-Tooth and Bone‘ are a suggestion at bigger and better things. Catchy choruses and intricate melodies make for an excellent soundtrack to the upcoming months, whether you’re planning to kick back and relax or throw a party. 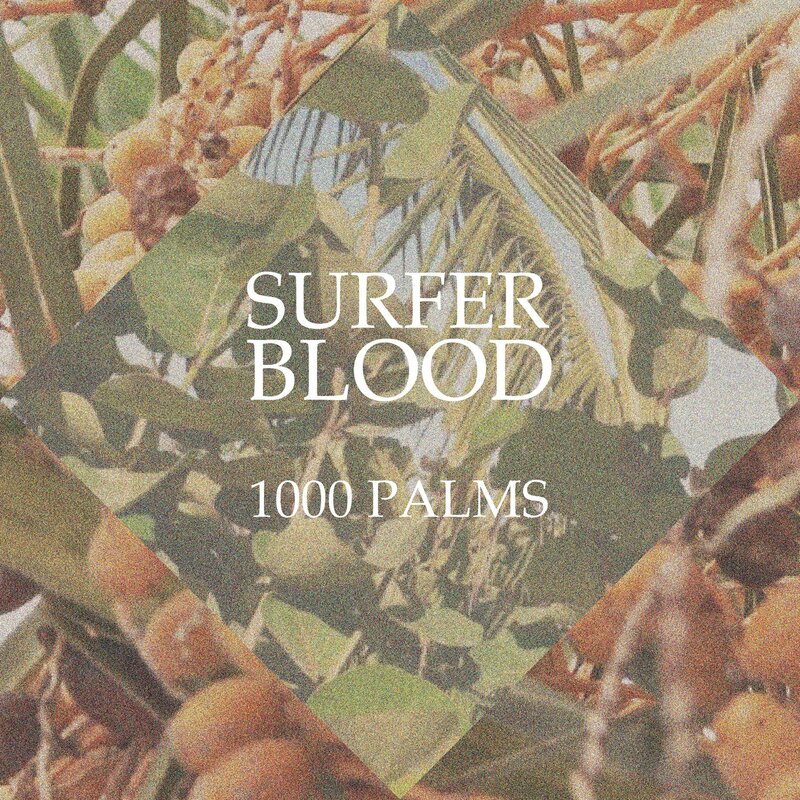 It’s easy to pinpoint exactly what Surfer Blood are trying to convey with their music. For example, ‘Covered Wagons‘ is easy-listening, much like a majority of the album, and allows listeners to be in tune with the lyrics above all else. For the most part, themes suggest romance – whether that’s lost, or being pursued, Surfer Blood perform with a confidence in knowing what they’re doing. The tracks that play things out, ‘Other Desert Cities‘ and ‘NW Passage‘ are some of the strongest and therefore strategically placed, imprinting themselves on the listener’s mind. They contrast each other nicely with the former taking a more high-energy, upbeat approach, where the latter finds its strength in gentle acoustic guitar and relatable lyrics. Overall, 1000 Palms is a fairly good feat. Surfer Blood might not be the most out there of bands, but they seem comfortable with what they’re doing and as a result, their listeners find comfort too.